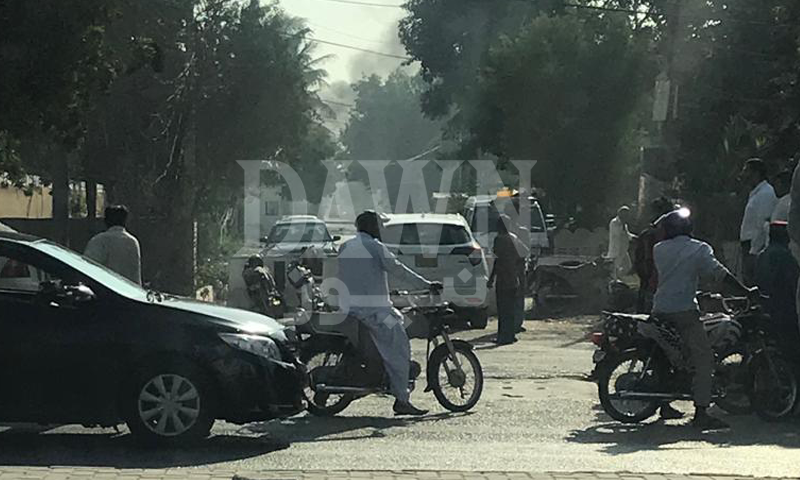 A terror attack targeting the Chinese Consulate situated in Karachi's Clifton area was foiled by security forces on Friday, leaving at least seven people dead. 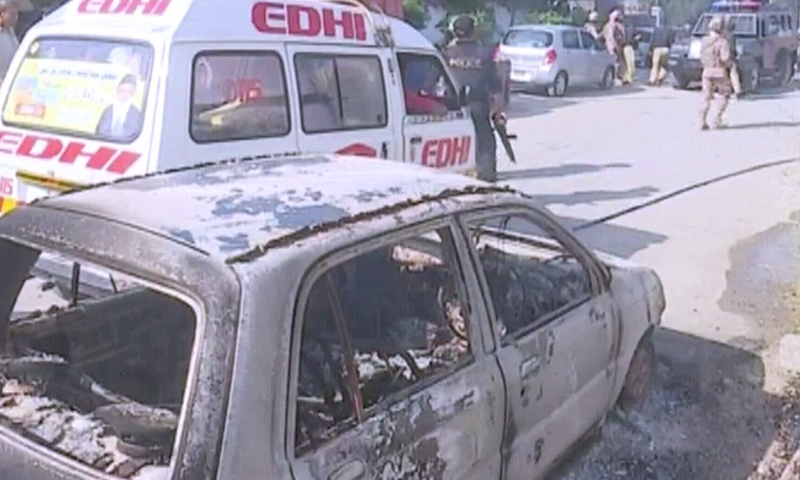 Two policemen lost their lives due to multiple injuries caused by explosive material, while a private security guard was injured in the blast, Dr Seemin Jamali, JPMC Executive Director, told Dawn. The police officers were identified as Assistant Sub Inspector Ashraf Dawood and Constable Amir, while the private security guard was identified as Muhammad Juman, according to police. Two civilians, a father and son, named Zahir Shah and Abdul Karim, were also killed in the attack, Dr Jamali said. Three terrorists were killed in the operation by security forces, according to Sindh Police and the army's media wing. A map showing the site of the attack. The heavily-guarded E-Street neighbourhood, which is considered a red zone, is home to a number of upscale restaurants, diplomatic missions and schools. The schools and eateries were locked down while a clearance operation was initiated. Foreign Minister Shah Mahmood Qureshi and police officials said it was too early to comment on who was behind the attack. However, the banned Balochistan Liberation Army (BLA) via its Twitter account — which has now been suspended — reportedly claimed responsibility. The claim could not be verified independently. Gunshots and multiple blasts were heard in the area between 9:30am and 10am. Images from the area showed smoke rising from the Chinese Consulate building, which also serves as the residence for Chinese diplomats and other staff. The attackers first opened fire at a checkpost, then detonated a hand grenade in the area, DawnNewsTV reported. Additional Inspector General (AIG) Amir Shaikh said that the attackers had parked their vehicle at some distance from the embassy before moving towards it. Defence analyst and security contractor Ikram Sehgal, whose company's guards have been posted at the consulate, said that the attackers engaged in an exchange of fire with policemen. After the policemen were martyred, he said, the attackers proceeded towards the gate of the consulate. However, the guards were quick to usher civilians with consular business into the building and shut the gates behind them. Chinese staff at the embassy were taken to a main building, Sehgal added. 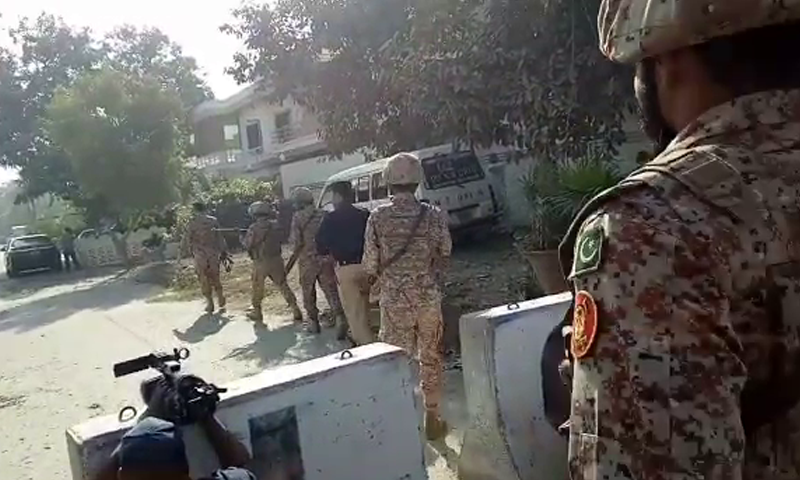 Muhammad Ashfaq, a police official quoted by the Associated Press, said that the attackers opened fire at the consulate guards and then managed to breach the main gate and enter the building. Shortly after, the Rangers arrived in the area and an hour-long exchange of fire took place between security forces and the attackers, leaving three terrorists killed. Weapons and explosive materials were recovered from the attackers, police said. Deputy Inspector General (DIG) South Javed Alam Odho told AFP that at least one attacker had been wearing a suicide vest which did not detonate. Police and Rangers began a combined operation in the area, and the Bomb Disposal Squad began conducting a sweep to ensure there are no more explosive materials in the area. Police said that all Chinese staffers "are safe and secure". 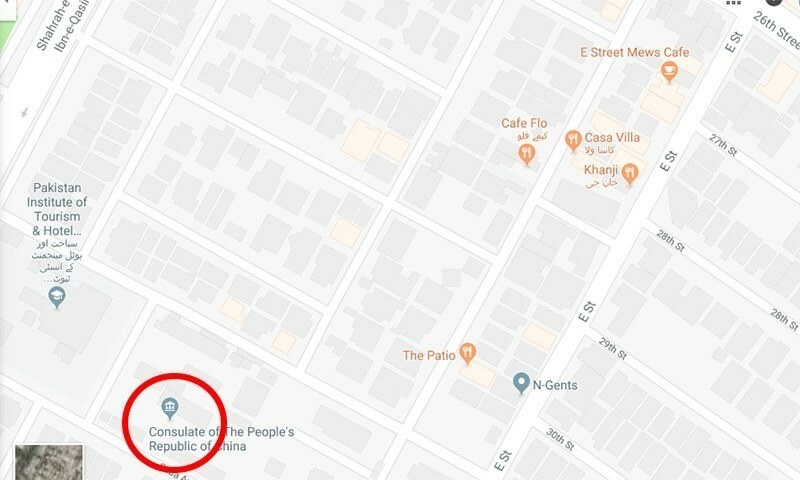 The security situation has been brought under control and all areas will soon be cleared, they added, and police have been deployed inside the consulate. 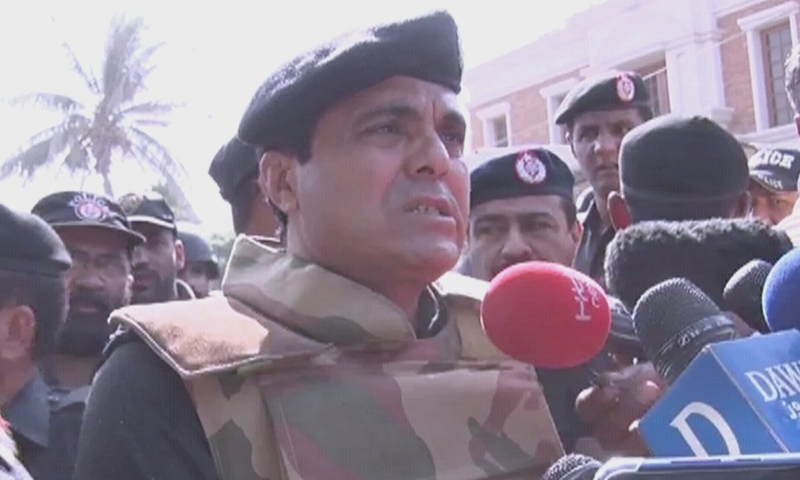 At 12:15pm, a Rangers spokesman told journalists that the search operation had been completed. He added that all diplomatic staff is secure, and praised the Rangers, Police and FC personnel for their quick response to the attack. Explosives and weapons were recovered from the site, he said, adding that more details would be shared later. Sindh police chief Syed Kaleem Imam and Chief Minister Murad Shah both reached the Chinese Consulate following the terror attack. IGP Imam briefed the Chinese consul general about the successful combined operation conducted by security forces. He also congratulated Assistant Superintendent Police Suhai Aziz Talpur ─ who has been handed the charge of SP ─ for running the successful security operation which foiled the attack. The IGP also recommended ASP Talpur for a Quaid-i-Azam police medal for demonstrating bravery during the attack. She is the first female police officer for whom the award has been recommended, according to the Sindh police. Governor Imran Ismail also took notice of the attack. The governor called for a report on the matter from the Sindh police chief. Shah later told media persons that three terrorists reached the Chinese consulate at around 9:10am. "The police stationed at the consulate resisted and an exchange of fire began," he said, adding that the terrorists had wanted to enter the consulate premises but their attempts were thwarted by police. 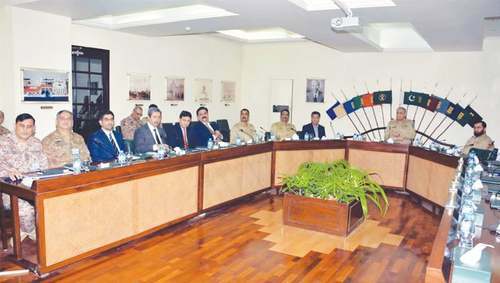 While presiding over a special law and order meeting held at Chief Minister House, Shah directed law enforcement agencies to speed up intelligence-based targeted operation against terrorists in the metropolis. Shah raised concerns over the fact that the terrorists equipped with weapons and explosives stayed somewhere in the city, then travelled from the place of their stay to Clifton but were not checked anywhere. “This shows that our road checking system needs to be stricter and more effective,” he said and directed AIG Shaikh to conduct snap checking in the city. The chief minister directed IGP Imam to look after the families of the two policemen who valiantly laid down their lives in the line of duty and also make necessary arrangements for shifting of the bodies of both the civilians to Quetta, their home town. Prime Minister Imran Khan condemned the attack and ordered an inquiry into the incident. Speaking at a cabinet meeting, the premier said the security forces had "reached quickly and neutralised the attackers". "It could have been worse if they [the terrorists] had gone inside," he said. "We had prior indication that attempts would be made to destabilise Pakistan," he said, praising the security forces for their quick response. The PM later tweeted saying that today's attacks in Karachi and Orakzai were "part of a planned campaign to create unrest in the country by those who do not want Pakistan to prosper. Let there be no doubt in anyone's mind that we will crush the terrorists, whatever it takes." "The failed attack against the Chinese Consulate was clearly a reaction to the unprecedented trade agreements that resulted from our trip to China. The attack was intended to scare Chinese investors and undermine the China-Pakistan Economic Corridor. These terrorists will not succeed," he added. Director General Inter-Services Public Relations Maj Gen Asif Ghafoor lauded the professionalism of the first responders. "From preempting the terrorism attempts to foiling these at first checking point is the testimony," he added. "Salute to our police and its martyrs." Foreign Minister Shah Mahmood Qureshi also condemned the incident and praised the way the attack was foiled by the law enforcement agencies. "This was a sad incident. The two terrorists involved in the incident have been killed. We are in contact with the Chinese consul general," the foreign minister said. He added that Pakistan and China would together defeat the forces that wish to halt development in the country. Beijing also strongly condemned the attack and asked Pakistan to ensure the safety of Chinese citizens in the country. "We appreciate the Pakistan Army and Police for their timely and proper action against the attack. We believe that the Pakistan side is able to ensure the safety of Chinese institutions and personnel in Pakistan." "Any attempt to undermine the China-Pakistan relationship is doomed to fail," a statement tweeted by Chinese Deputy Chief of Mission Lijian Zhao said. Today's attack is also the latest in a series of assaults on Chinese nationals, including workers involved in the multi-billion dollar infrastructure project in Pakistan. Thousands of Chinese workers are employed in development of about $60 billion worth of infrastructure projects under Beijing's 'Belt and Road' initiative. The port and road-building projects have come under frequent attacks in Balochistan. China had in Dec 2017 warned its citizens in Pakistan to be on alert after receiving intelligence reports about possible attacks targeting Chinese. The Chinese Embassy in Islamabad said it had information about a "series of terror attacks" planned against Chinese organisations and personnel. The government has promised Beijing that it will deploy troops to secure the China-Pakistan Economic Corridor and Chinese nationals in the country. 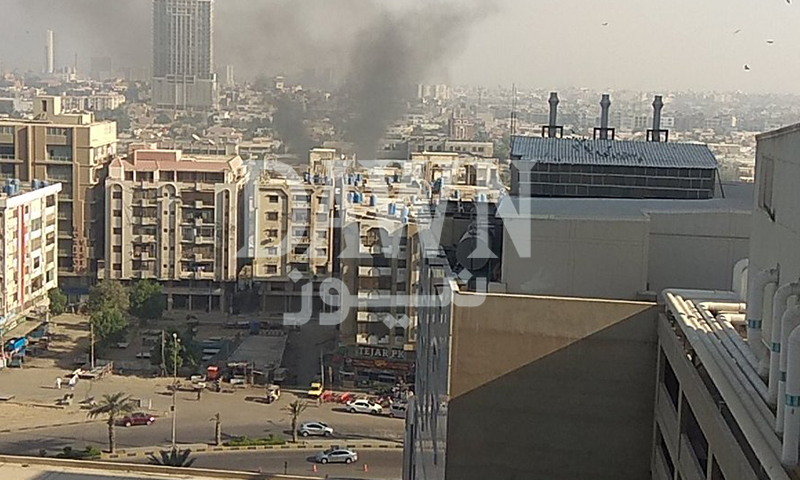 A motorcycle bomb in 2012 also exploded near the Chinese consulate in Karachi. At the time, police said it appeared the target was not the consulate but the Rangers, who had been the primary targets of a string of IED explosions over a two-week period in July that year. However, some police officials believed it may have been tied to the Zulfikarabad city project which, at the time, was likely to be taken up by the Chinese. Security officials were of the view that the attack could be the handiwork of elements linked to a separatist group. Although the sprawling metropolis has seen a sharp decline in terror attacks since the Rangers operation began in 2013, this is the second blast in Karachi in a week. On Nov 17, a blast in the Quaidabad area killed two teenagers and wounded 12 others. An initial probe into the attack suggested the involvement of sub-nationalist groups. With additional reporting by Naveed Siddiqui. Very alarming. Seems some people are clearly inimical to Pak-China friendship and want to create a negative and disruptive atmosphere. Agents of these people abound in Karachi. 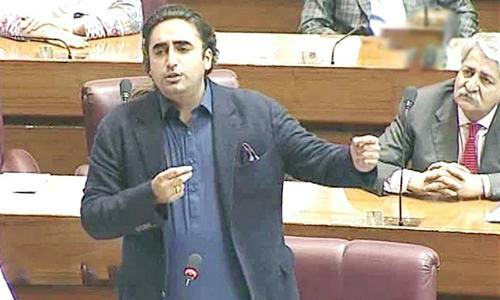 The Sindh Government must take quick and stern action, in collaboration with federal organizations, to establish stable law and order situation in the city. Catch them alive to have their sources know. Catch them alive so that we know who they are and who are controlling them. Killing the pawns may not be enough. We know the coward perpetual enemy of Pakistan. It's terrorists had to bite the dust today. Great job Pakistan. @Syed Anjum Ali, "Seems some people are clearly inimical to Pak-China friendship and want to create a negative and disruptive atmosphere" True. And there are innumerable citizens too affected by this friendship today and in future, in terms of resources, real-estate, livelihoods etc. They are all unifying and getting their act together as they consider this friendship to only benefit one province at their cost. We need to be very careful and cautious. Pakistan zindabad. Inalahawainnallahayrajioon to the police soldiers our defenders. Nothing will get in the way of our SinoPak friendship. SinoPak Iron Brothers 4 Life! Congratulations to security over successfully foiling the attack. Normally in such commando style terror attack, causalities are often high but our security forces neutralized the militants quite efficiently. Prays for the two deceased police officers. Enemy is trying its best to sabotage the situation...so this clearly shows that Pak-China things are going on the right path..
Great job in securing Chinese staff. But I had hoped some attacker would have been caught alive to expose the real culprits behind this attack. Dreadful! Kudos to the bravo soldiers who laid their lives down for the safety of others. Together shall we defeat this menace! The only country to benefit from a rift between a China and Pakistan, is India. At least now it should be clear to everyone there are no good terrorists. All terrorists are dangerous to humanity. What is the identity of the attackers? Catch them alive to have their sources know."" What would any one can do even if source is known. ?Nothing Remember the famous three words coined "Non state actors""
@Anonymouseeeee, The only country to benefit from a rift between a China and Pakistan, is India." Is it? How? ISI and other intelligence agencies should thoroughly investigate this matter to find out who is behind this attack. We should also keep our Chinese friends in the loop on the progress in investigation. Sad that our policemen died protecting Chinese. Why do we have to shade out blood for others? Are these Attackers affected by CPEC ? @Joe, now we cannot answer this question, because it is a matter of National Security. CJ should make JIT to investigate this incident and direct them to report within 1 week. Enemies of Pakistan want to destroy CPEC and other important Pak-China development projects. 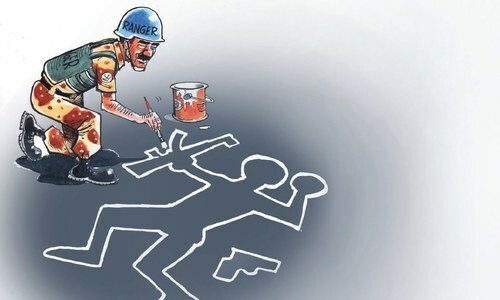 Pakistan needs to adopt proactive approach towards hostile agencies from across the border otherwise no peace in here. Us and india are against CPEC. Time to wake up pakistan and know who your enemies. @Skyhawk, -"Enemies of Pakistan want to destroy CPEC"
Who will attack a sinking ship? We all should condemn any violence for whatever reason. Really sad about the loss of innocent Pakistani lives. May they all rest in peace. For sure India is behind the attack. Very ineffective security. Too many security officials visible everywhere but unprepared and unable to stop if a terror attack happens. Security agencies need to use technology and stop any terror attack before it happens or respond seconds after it happens. India written all over this. Great job done by security staff! Indian media is all praise for the lady police officer. Terrorism should be crushed as early as possible. Thank you Sindh police for quick and effective action. Delighted to see the entire government is unanimous in its reaction. This is the way Pakistan can be made safe and be open for business for Pakistanis and foreigners. It's very clear India is behind this all. There is no doubt that India is behind this terrorist attack. However, our leaders lack the courage to name India. Foreign Minister Shah Mahmood Qureshi and police officials said it was too early to comment on who was behind the attack. --- I would like to know what the interior minister said, not the foreign minister. @Asif Qadri, you don’t need courage, just lack of common sense for that! Hand of India for sure. Another failure of intelligence and security. Terrorists should have been stopped before entering gate and building. @Umair Karim, Really, you still do not know who is supporting them? Surely those who are using these illiterate terrorist who are not happy with China Pakistan relation.